One of two - possibly soon to be three signs - in Scioto County cautioning drivers of the presence of an autistic person. This one sits in McDermott. While he had few details easily available to him when contacted late yesterday afternoon, Portsmouth Police Chief Robert Ware confirmed there had been a hit and run accident in the Sciotoville neighborhood of Portsmouth early Monday evening. The incident apparently involved a 14-year-old girl, who according to her mother is borderline autistic. April Nelson said her daughter was chasing a friend when they both apparently ran out into the roadway in the 1500 block of Harding Avenue about 5 p.m. Monday. “She kind of pretends to do what other people do,” Nelson said, adding that when she saw her friend run into the street, she probably just assumed it was safe for her to do so as well. According to Nelson, she was told her daughter was struck in the stomach and bounced off the hood of the car, then hit the ground. The driver of the vehicle, described only as an older woman, got out of her car and asked her if she was okay. When the girl responded in the affirmative, the driver got back in her car and drove away. Nelson said while her daughter appeared to have sustained no serious injuries, she took her to the emergency room anyway. According to mom, she suffered some scratches and bruises along with a strained neck. However, Nelson said her daughter seemed fine on Tuesday. The upshot of the story may be placement of a sign warning drivers an autistic person lives in the neighborhood. 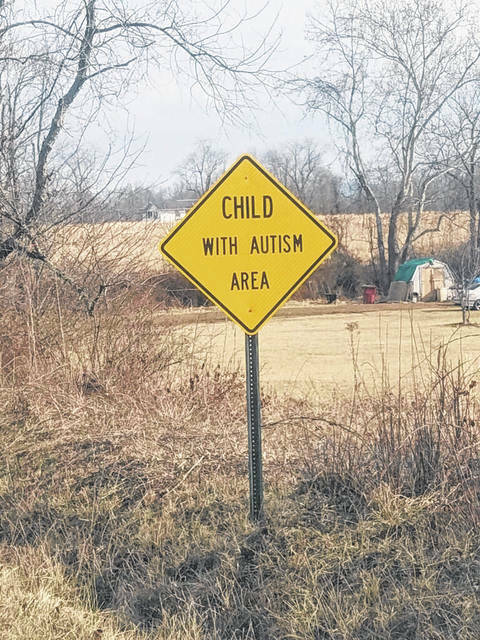 President of the Autism Project of Southern Ohio, Mike Bell (who is also an advertising representative for The Daily Times) has had two other such signs placed around Scioto County. One sign sits in South Webster on Bennett School House Road. The other is on Henley Deemer Road in McDermott. Nelson said the speed limit on the section of Harding Avenue where the accident allegedly occurred is 35 mph. However, she also contends many drivers seem to travel much faster. Nelson stated after speaking with parents who lived near the other two signs she was told those signs seemed to have gotten the attention of drivers who are beginning to slow down near the signs. Scioto County put up the two existing signs. The city of Portsmouth would need to put up the third sign. It’s not clear when or if that will happen but Nelson, who was upset the driver of the car left the scene without checking with an adult, clearly hopes it does. As he was not in his office when contacted, Ware referred further questions to a police dispatch supervisor. When called, a dispatcher spoken with said no supervisor and no further details were readily available. Nelson said a police officer did take a report regarding the incident and offered to supply her with a copy if she needed it. She added a neighbor’s closed-circuit TV caught at least part of the accident. However, the camera did not get the license plate of the car which allegedly struck the girl. The car was described only as a Navy blue GMC. Nelson stated the officer on the scene informed her without more to go on there may be little police can do regarding the incident. One of two – possibly soon to be three signs – in Scioto County cautioning drivers of the presence of an autistic person. This one sits in McDermott. https://www.portsmouth-dailytimes.com/wp-content/uploads/sites/28/2018/07/web1_sign-jpeg.jpgOne of two – possibly soon to be three signs – in Scioto County cautioning drivers of the presence of an autistic person. This one sits in McDermott.